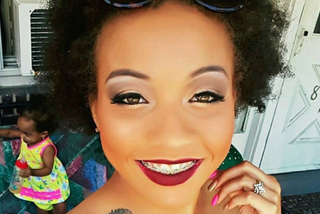 The family of Korryn Gaines, the young Maryland mother who was shot and killed by a Baltimore County police officer in August, is planning to file a $4 million lawsuit alleging wrongful death, CBS Baltimore reports. According to the report, the family plans to sue Baltimore County and the officer, identified only as Officer First Class Ruby, for $2 million each. The family claims that Gaines' death was wrongful and that police suppressed her speech, used excessive force and showed gross negligence in the fatal encounter. The family also says that an eyewitness account from Gaines' next-door neighbor paints a different picture of the day from what police statements have indicated. Police have said that Gaines was shot after pointing a shotgun at officers and threatening to kill them after they tried to serve arrest warrants on her and her boyfriend, the site notes. A seven-hour standoff ensued, with Gaines using social media to broadcast some of the situation. Authorities asked Facebook to deactivate Gaines' accounts and remove those videos, alleging that her followers were encouraging her not to comply with their orders. Ultimately, police said, negotiations broke down and Gaines said, "If you don't leave, I'm going to kill you." One officer discharged a round at Gaines, but it is not known whether she was hit by that bullet. Gaines then returned fire but did not injure any officers. Officers then fired again, hitting and killing Gaines. Gaines' 5-year-old son, Kodi, was struck during the exchange of gunfire, suffering non-life-threatening injuries. Gaines, Coleman said, also requested to inspect a copy of the warrant the police were attempting to serve, a request that Coleman says was denied. According to court documents, Coleman said that police officers turned away Gaines' family members who "desperately offered and pleaded to help de-escalate the situation," and that right before the deadly gunfire, according to Coleman, an officer said, "I'm sick of this [s—t]."